In a large skillet heat 2 teaspoons olive oil over medium-high heat. Add the chopped green & red bell pepper and red onions. Sauté until tender but still crisp; then add the spinach and cook until wilted. Add pasta sauce to the skillet, season with pepper and Italian seasoning, to taste. Stir well, cook until sauce is heated through. Combine cottage cheese, yogurt, and parsley in a bowl and stir until well combined. Place 3/4 cup pasta sauce in the bottom of a baking dish (I use the half-sized aluminum foil pans because I typically double the batch and make an extra tray to freeze). If using the no bake lasagna noodles, layer them on top of the pasta sauce (do not overlap - they expand while cooking). If you’re not using the noodles, layer the eggplant on the sauce. Add small teaspoon sized drops of the cottage cheese mixture on top of the noodles (or eggplant if skipping the noodles). 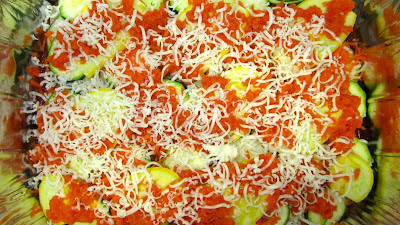 Layer the zucchini, then sprinkle some grated carrot evenly over the zucchini; next layer the yellow crooked squash, then add the pumpkin. Lightly sprinkle with a little mozzarella and Italian seasoning, then add just enough sauce to cover the entire layer; repeat the process until you run out of vegetables to layer (about 3 layers - depending on the size of your pan). Before adding the final layer of pasta sauce - sprinkle half of the shredded parmesan on the vegetable layer; cover with sauce then sprinkle with remaining mozzarella and parmesan. Cover with foil and bake for 40 minutes at 400˚F. Remove foil and bake an additional 10 minutes or just until the cheese begins to take on a little color. NOTE: The best part about veggie lasagna is you can use pretty much any vegetables you want. I usually add broccoli and/or peas if I have them on hand. The pumpkin can easily be substituted for spaghetti squash or acorn squash. Use the cheese sparingly, but load up on the veggies - you'll have a colorful, delicious and satisfyingly healthy meal!